When I was in Las Vegas the other week, my husband and I went to The Original Pancake House in Henderson and tried out their German Apple Pancake. Trust me on this — that pancake is too much for one person in one sitting. It absolutely delicious and will satisfy two people quite nicely. Anyway, the restaurant is next to an upscale shopping mall, where we parked. As we walked through, I noticed that the mall was hosting a special “safe” trick-or-treat event for kids. CityWalk and L.A. Parent Magazine are hosting one in Los Angeles. I’m sure that the malls in your area will be hosting one as well. 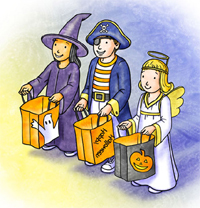 When I was kid, I always looked forward to going trick-or-treating in my neighborhood. But after news started spreading that razor blades and poison were popping up in kids’ treat bags, this tradition started dying a slow death. But marketing has come to the rescue. Now shop owners are banding together to provide safe trick-or-treating options, while introducing you and your kids to their wares. OK. It might not be the same thing, but for the youngin’s — it’s just as much fun. Are You a Designer or Sculptor?